This pirate package consists of, 1 cupcake stand with a skull flag, 24 pirate skull cupcake wrappers, and 24 cupcake toppers. Make this party an unforgettable one with these pirate themed baking decorations. 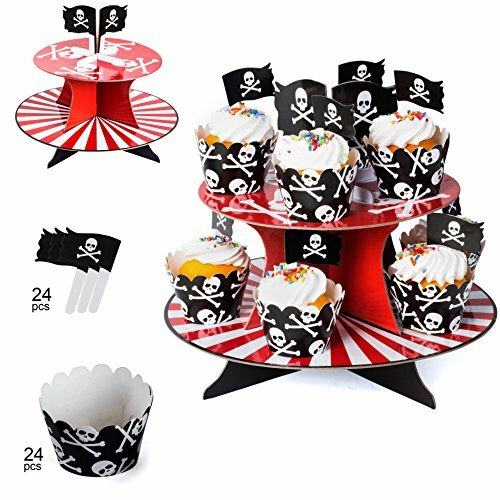 This pirate package consists of, 1 cupcake stand with a skull flag, 24 pirate skull cupcake wrappers and 24 cup cake toppers. Cupcake stand is made of sturdy cardboard to support all your pirate themed cupcakes. Bring your party theme into all the goodies you bake with some pirate essential décor. Mark your territory with these pirate skull flag cupcake toppers. Ahoy! Let the voyage begin and start collecting your gold with these party essentials pirate décor.